This workshop under the auspices of the German Society of Crystal Growth (DGKK) brings together scientists and scholars from industry, research labs, and universities to present and discuss the recent advances in the field of oxide crystals, dielectric materials, laser and non-linear optical crystals, solid-state lasers, and related topics. 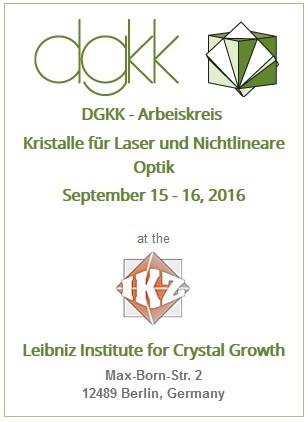 After taking place in the ISL in Saint-Louis (France) and the FEE in Idar-Oberstein (Germany), this 5th workshop 2016 was held for the first time in Berlin, Germany, at the Leibniz Institute for Crystal Growth (IKZ). The workshop will start on Thursday, Sep 15, 2016, and end on Friday, Sep 16, 2016.